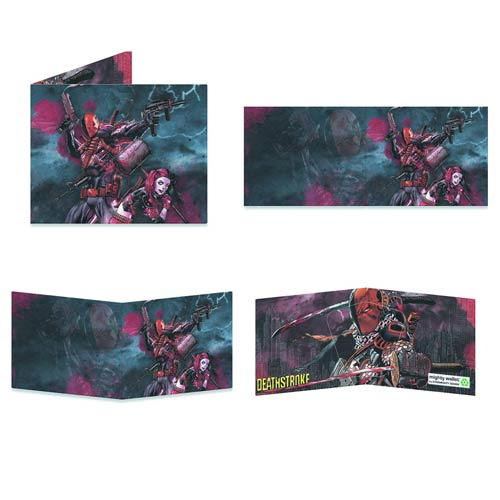 Shopping for DC Comics Wallets? Nobody's crazy enough to touch your wallet with Deathstroke and Harley Quinn front and center! Both supervillains appear in the glorious artwork on this Deathstroke and Harley Quinn Mighty Wallet - Previews Exclusive. Check it out! This wallet is tear-resistant, water-resistant, expandable and recyclable! Made from Tyvek, this cool wallet resists tearing because of thousands of interlocking plastic fibers spun in random patterns, giving it incredible strength and durability! Ages 13 and up.